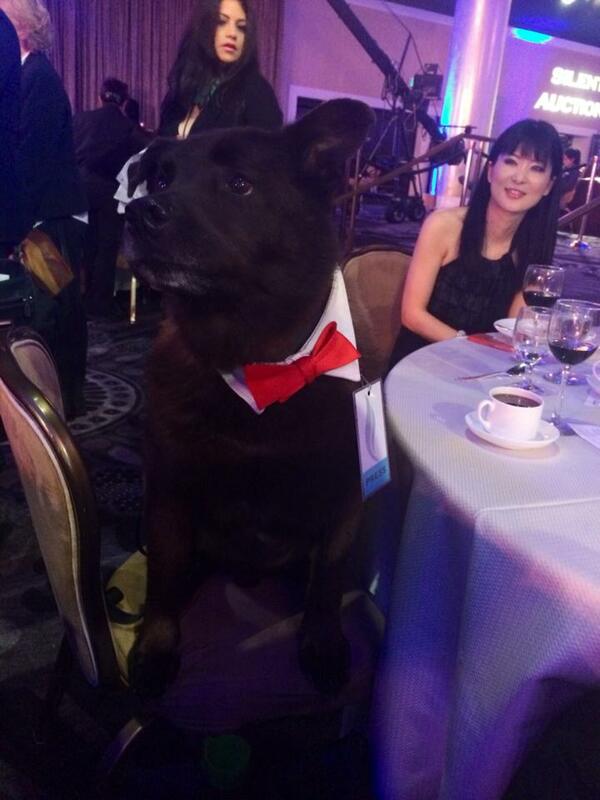 This past Saturday at the Beverly Hilton, they should have put Kleenex boxes at every fancy dinner table, so guests could wipe their tears as they heard the heart wrenching and inspiring stories of dogs that have shown sacrifice, bravery, and loyalty as they have faithfully helped humans, in far more capacities than I could imagine. 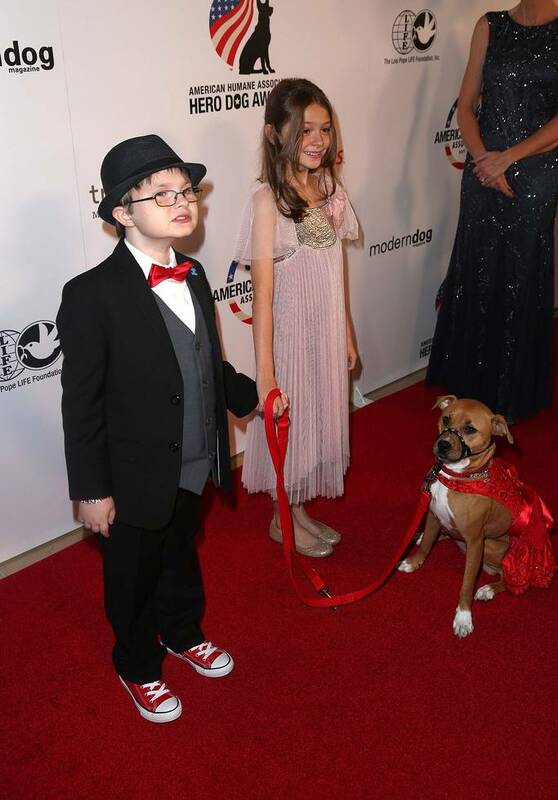 Beautiful dogs in all shapes and sizes, even some missing ears or showing their external scars, donned the red carpet with their beloved owners and families, each with a story to share of their canine’s beauty in the world. We enjoyed meeting so many people from around the United States, many who came great distances to honor their heroic dog. Many stories tugged at my heart strings, to the point of feeling like I couldn’t breathe. I wanted to kiss and hug every pup in the room. During a nationwide search, 135 dogs from all across the country were nominated and more than one and a half million votes were cast by the American public, culminating in the selection of eight extraordinary canine finalists. I was moved to see the last surviving search and rescue dog from 9/11 who also helped save lives in the 2002 Olympic Winter Games, and Hurricane Rita in 2005. Retired now from active duty in 2008, she now continues as an ambassador for search and rescue dogs as she visits elementary schools where she helps first graders learn to read, even in her old age. 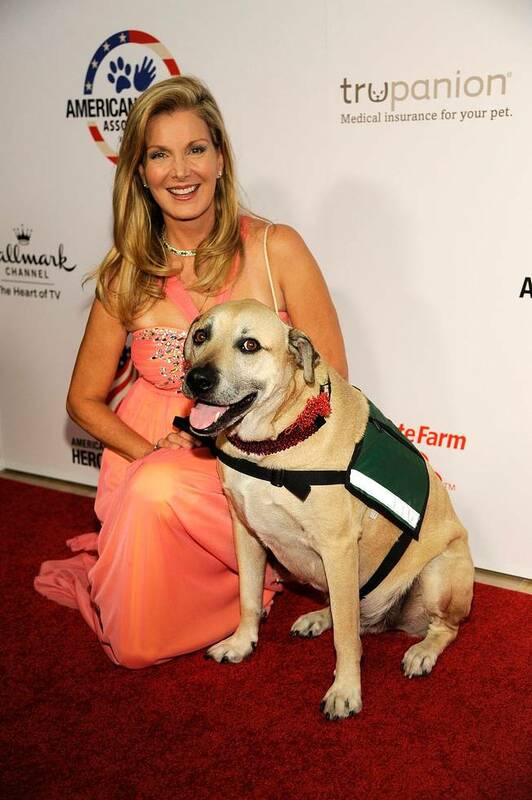 Although all finalists are winners, this year the winner went to Susie, a pit bull mix who I happened to meet couch side with her lovely owner Donna Lawrence from High Point, North Carolina as they finished the red carpet. 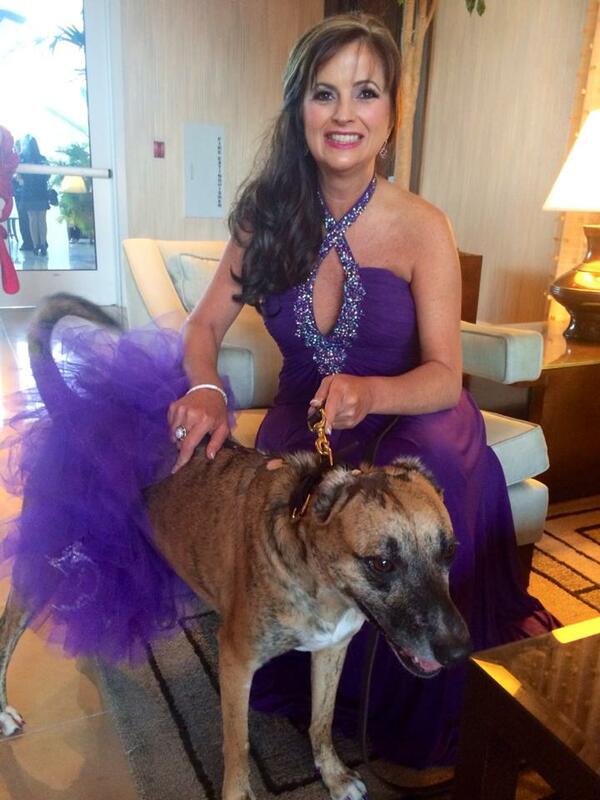 Donna’s pup was dressed in a purple tutu, and I watched as the two showed great affection for each other. While they were giving hugs and some kisses to each other, I asked the owner in her long gown if I could snap a few pictures. 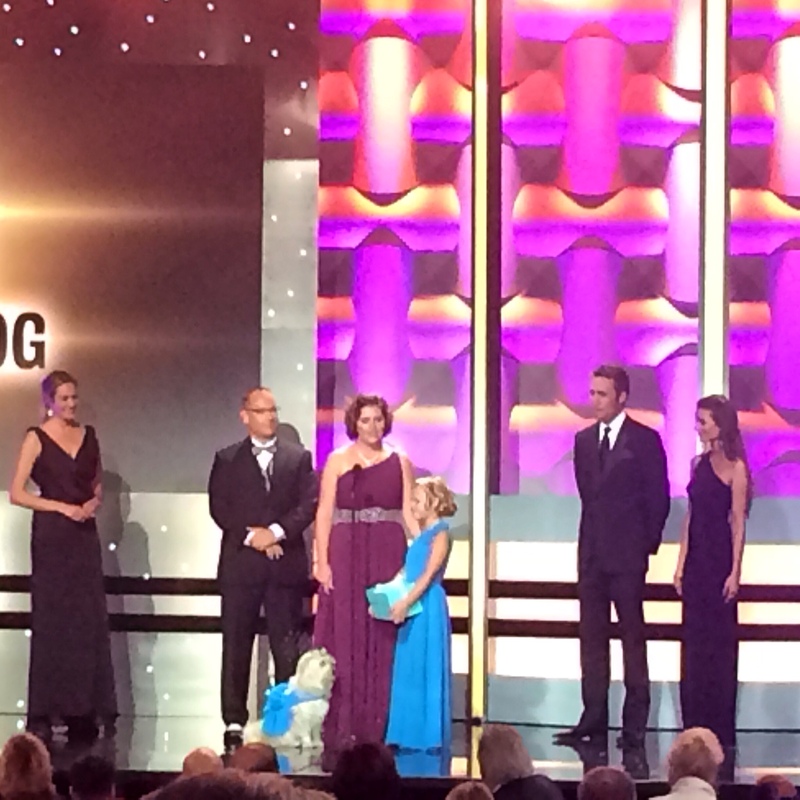 I didn’t know their harrowing story yet, or that they would win, in support of all abused dogs. Named this year’s top “American Hero Dog” thanks to this event put on by the American Humane Association, the sweet dog with missing ears and scars down her back from horrible burns overcame the odds and brings hope to both animals and people. Susie was only a puppy when her owner beat her savagely and set her on fire, leaving her for dead in a local park in Greensboro, North Carolina. Apparently, the dog was beaten so bad she was missing teeth, had a broken jaw, and most of her body was burned. After being rescued by a local animal shelter and nursed back to health, she was adopted by Donna Lawrence, who had been the victim of a terrible dog attack that nearly killed her and left her without the ability to have children. Together, they helped each other heal from their physical and emotional wounds, triumphing over pain and fear to become voices for abused animals and helping pass “Susie’s Law” in North Carolina, which calls for harsher penalties for convicted animal abusers. Susie became the subject of the movie, “Susie’s Hope,” and working side by side, Donna and Susie continue to make the world a better place for others by visiting hospitals, schools, and nursing homes to inspire people never to give up. This year’s therapy dog category sponsor, as well as the campaign’s online sponsor, is the leading animal health company, Zoetis. After rooms of silent auctions items (many pet related) and cocktails, guests in long flowing fancy gowns and LA suits made their way to the grand ballroom for food, stories, and music by the much loved 90’s band Wilson Phillips, who brought the crowd to their feet for a standing ovation. After meeting them earlier in the night couch side for some casual conversation, the trio reminded us of their 90’s hits, like “Hold On for One More Day.” They ended singing so sweetly “California Dreaming.” I had a chance to speak to Chynna Phillips for awhile, who said she performs about once a month now, since she wants to spend time with her children. Hosted by television and film star James Denton and model and animal advocate Beth Stern, the sold out event was accompanied by a galaxy of stars and presenters including Bruce Boxleitner, Lacey Chabert, Philippe and Ashlan Gorse Cousteau, Cristina Ferrare, Lori Loughlin, Bailee Madison, Kellie Martin, Marlee Matlin, Brandon McMillan, Larry Miller, Barbara Niven, Pauley Perrette, Charlotte Ross, Mark Steines, Victoria Stilwell, and more. American Humane Association has also been involved in helping military heroes, and has been working with Mission K9 Rescue and the U.S. War Dog Association to bring home and reunite military dogs with their hero handlers. 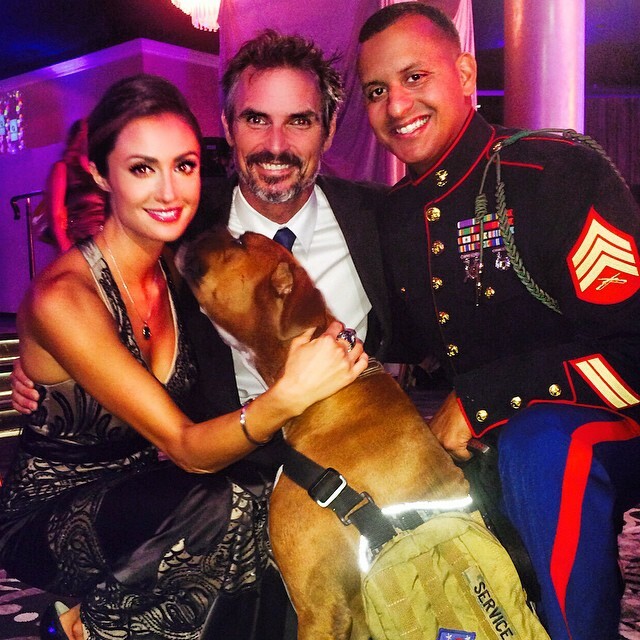 Following an emotional scene during the 2014 American Humane Association Hero Dog Awards™ in which the audience met Marine Corporal Matt Foster who was reunited with his beloved former military hero dog Mick after a year apart following their service in Afghanistan, noted philanthropist, animal welfare and disabled veterans advocate Lois Pope announced a pledge of $150,000 to support American Humane Association’s efforts to aid and pay tribute to the nation’s brave military hero dogs and their former handlers. Mrs. Pope is donating $50,000 to the American Humane Association’s “K9 Battle Buddies program” to bring more of these veterans back together on American soil where they can both live out their well-deserved retirements in the way they deserve after a lifetime of service. To bring national attention to these heroes on both ends of the leash, Mrs. Pope is also underwriting a $100,000 special effort to include these military hero dog teams in this year’s America’s Parade, which takes place on Veterans Day 2014 in New York City. Her generous contribution will give these reunited dog teams their own part in the parade – and a national platform so that millions of Americans can honor them as they should be honored. 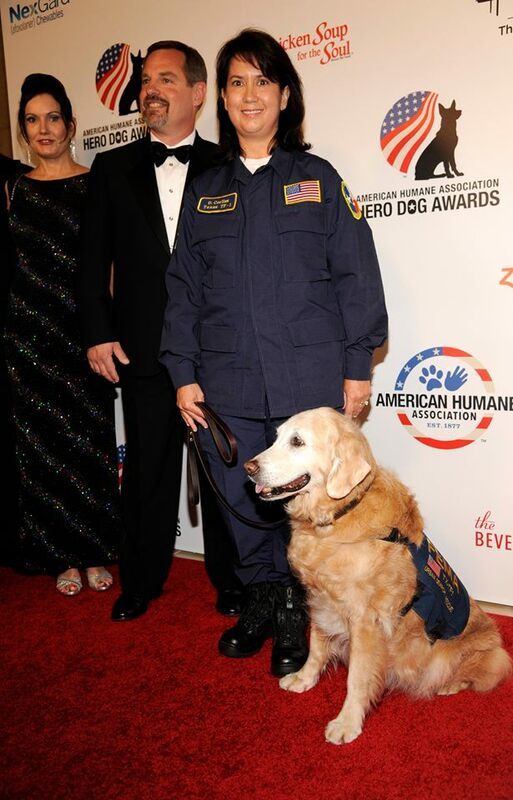 The Hero Dog Awards were created to celebrate the powerful relationship between dogs and people and recognize extraordinary acts of heroism performed by ordinary dogs. The program will air as part of Hallmark Channel’s Pet Project, the network’s cross-platform advocacy campaign designed to celebrate the joy and enrichment animals bring to our lives. The entire evening consisting of therapy dog “Susie” and seven other American “Top Dogs” will premier nationally on the Hallmark Channel October 30 at 8 PM ET/PT and 7PM Central. WINNER: Kai (San Antonio, TX) – The San Antonio Fire Department’s six-year-old black Lab was rescued from a shelter and given a second chance and a new lease on life. Her nose for finding things was apparent when she was seen digging the only tennis ball out of the shelter’s box of toys. After undergoing extensive training, she now helps keep others safe by investigating arson cases by using her powerful nose to detect the common accelerants that arsonists use to commit their deadly, destructive crime. In her four-year career she has taken part in more than 200 investigations and also helps to keep her community safe by teaching children about the importance of fire safety. WINNER: Xena (Johns Creek, GA) – This pit bull was knocking on death’s door when she was brought into a Georgia shelter outside Atlanta. Emaciated and dehydrated, she was given just a one percent chance at survival. Unbelievably, she defied the odds, made a full recovery and was adopted by a family with a little boy with autism. Before, the child had closed himself off to the world, but the arrival of Xena sparked something in the child the family had never seen before, and he went from once silent to constantly singing to and chatting with Xena the Warrior Puppy. Now, they’re an inseparable pair. WINNER: Xxon (Bloomfield, CT) – In January 2010, an explosion in Kandahar, Afghanistan left Air Force Sergeant Michael Malarsie blind and killed four of his fellow servicemen, including his best friend. Though he lost his sight, Sgt. Malarsie was soon partnered with Xxon, and they became the only active duty guide dog team in the Air Force. Now retired, Sgt. Malarsie continues to work with Xxon every day as the dog helps get him safely to wherever he needs to be. The pair are also outspoken advocates for the importance of service dogs to members of the military, and have visited members of Congress to discuss this important issue. 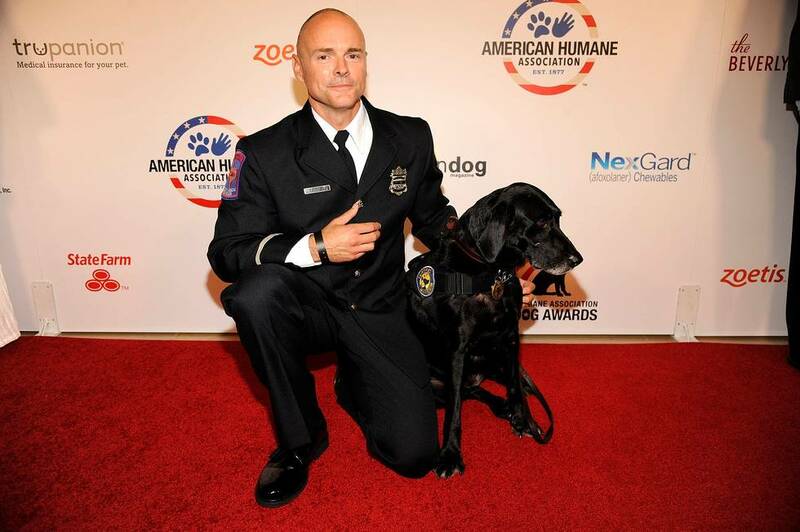 WINNER: Kota (Winchester, VA) – On January 3, 2014, this member of the Winchester, Virginia police force was injured while responding to a burglary in progress. While in the process of detaining the suspect – who had hidden himself in the upstairs crawlspace – the ceiling gave way and the dog tumbled to the hardwood floor eight feet below. Undeterred, he bravely climbed back up the stairs and helped his fellow officers finish the call, fighting with a severely fractured limb to ensure their safety. Kota is now undergoing extensive physical therapy with hopes of one day returning to active duty. WINNER: Chaney (Waverly, IA) – This eight-year-old lab retired from the Marines in 2013 after multiple tours in Iraq and Afghanistan as an IED detection dog. While deployed, Chaney not only saved countless lives by locating IEDs, he also served as a great morale booster for everyone in his squad. Since retiring, Chaney was adopted by one of his handlers and they now spend many hours volunteering around the Midwest for a nonprofit organization called Retrieving Freedom, Inc., which trains service dogs for disabled veterans and children with autism. WINNER: Bretagne (Cypress, TX) – Over her long career, Bretagne has made a significant contribution to the search and rescue community through her many deployments including the World Trade Center after 9/11, the 2002 Olympic Winter Games, and Hurricane Rita in 2005. Although she retired from active duty in 2008, she now continues as an ambassador for search and rescue dogs as she visits elementary schools where she helps first graders learn to read. Even at her older age, she still goes into work with a bigger lust for life than dogs half her age. WINNER: JJ Krawczyk (Apex, NC) – Once a shelter dog, this small hero was rescued, trained, and partnered with a young girl suffering from a rare condition known as Mastocytosis, which can cause severe reactions for her. This dog with the gifted nose can detect when reactions are about to occur, alerting the girl’s parents that her life might be in danger. When she needed surgery recently, doctors requested the dog be present in the operating room to help keep the girl alive. Though she doesn’t have a medical degree – or even a pedigree – she’s one of the most powerful tools for doctors to keep the young girl’s condition at bay. Each of the eight finalists received $1,500 to be donated to one of American Humane Association’s charity partners. Susie won an additional $5,000 for her charity. In this way, more heroes may be nurtured.